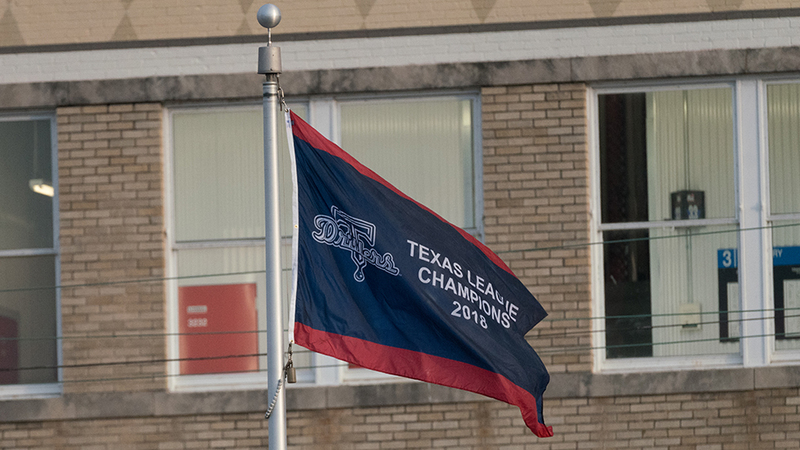 TULSA, OK - On a festive Opening Night when the Tulsa Drillers celebrated their 2018 Texas League Championship by raising the official championship banner above ONEOK Field, the Arkansas Travelers played the role of party spoiling guests. The Travelers twice erased Drillers leads before rallying for a pair of runs in the tenth to post a 6-4 extra-innings win in front of a sellout crowd of 7,910 in downtown Tulsa Thursday evening. The rallies from the Travelers came when Tulsa starting pitcher Dustin May departed after five dominant innings. The right-hander, who is rated as the top pitching prospect in the Los Angeles Dodgers farm system, opened the game by allowing only two hits in five shutout innings while striking out nine Travs batters. May left with a 1-0 lead, but he would not get the win. The Drillers had wasted little time in giving May a lead as Gavin Lux led off the bottom of the first with a lined base hit to center field. Consecutive one-out hits by Keibert Ruiz and Cristian Santana brought Lux home with the first run of the season. The RBI single from Santana came in his first Double-A at-bat. For the Travelers, they wasted little time in getting on the scoreboard once May departed. Reliever Shea Spitzbarth replaced him to open the top of the sixth and his second pitch was lined to the centerfield fence for a triple by Jake Fraley. Following a walk to Evan White, Kyle Lewis grounded a double just inside the third base bag, scoring both baserunners to give the Travs a 2-1 lead. Tulsa used its first two home runs of the season to go back in front. With two outs in the bottom half of the sixth, former big leaguer Chris Parmelee lofted a high, fly ball over the bullpen in right field to even the score. In the seventh, Zach Reks put the Drillers in front 3-2 when he hit a liner over the right field fence for another solo homer. Arkansas rallied against Tulsa reliever Layne Somsen in the top of the ninth to retake the lead. Somsen walked the leadoff batter, and after a sacrifice bunt, Fraley delivered a game-tying single, and when the throw from the outfield was wild, he advanced to third. White singled him home to put the Travelers back in front 4-3. The Drillers plated their fourth run in the bottom of the ninth to force extra innings. Lux doubled with one out to score Jared Walker, who had walked. The Travelers took advantage of Minor League Baseball's extra-innings rule, where a runner is placed at second base, to score a pair of unearned runs against Tulsa reliever Adam McCreery in the top of the tenth. The Drillers were unable to match the two runs as Parker Markel pitched out of a one-out, bases loaded jam by striking out Cody Thomas and retiring Reks on a game-ending ground out. *Los Angeles Dodgers legend and pinch-hit extraordinaire Manny Mota threw out the season's ceremonial first pitch prior to the game. *Lux and Omar Estevez led a 10-hit Tulsa attack with two hits each. Parmelee reached base four times by homering and drawing three walks. *The Drillers bullpen surrendered six runs on seven hits and five walks in its five innings. *The two teams combined for 26 strikeouts in the game with three different Tulsa hitters striking out three times each. *Each team used five pitchers in the game. *Arkansas starting pitcher Justin Dunn, who is rated as the number three prospect in the Seattle Mariners minor league system, allowed only the first-inning run in his five innings of work. The right-hander struck out seven. UP NEXT: Arkansas at Tulsa, Friday, April 5, 7:05 p.m. at ONEOK Field. RHP Ricardo Sanchez (First Appearance) versus RHP Yadier Alvarez (First Appearance).